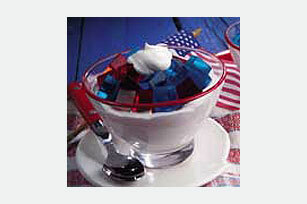 A "cloud" of whipped topping is swirled over the bottoms and sides of dessert dishes and filled with blue and red gelatin cubes for a patriotic treat. Stir 1 cup of the boiling water into each flavor dry gelatin mix in separate medium bowls at least 2 min. until completely dissolved. Stir 1/2 cup of the cold water into gelatin in each bowl. Pour each flavor gelatin into separate 8-inch square pan. Refrigerate 4 hours or until firm. Dip pans in warm water for 15 sec. Cut gelatin into cubes, using sharp knife which has been dipped in hot water. Loosen cubes from pan with spatula; refrigerate until ready to serve. Spoon 1/4 cup of the whipped topping into each of eight dessert dishes just before serving. Using back of spoon, spread whipped topping onto bottom and up side of each dish. Fill evenly with equal measures of the red and blue gelatin cubes. Store leftover desserts in refrigerator. Top each dessert with 1 Tbsp. additional thawed COOL WHIP Whipped Topping just before serving.